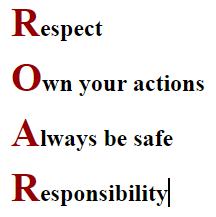 At Mission Valley we as wildcats ROAR- which stands for Respect, Own your actions, Always be safe, and Responsible. Students show their behavior in the classroom, cafeteria, playground, restroom and in the library. Students are rewarded daily by earning ROAR Referrals for showing great behavior. Mission Valley is a Character Counts!® school. This means the school follows and models the six pillars of character each and every day. Our behavior matrix sets expectations for student behavior and describes what each pillar will look like on campus. The Wildcat Pins and Pennants program is an ongoing award system that students earn at Mission Valley Elementary School. Upon enrollment at Mission Valley, we give a pennant to the student and they can earn pins by participating in various activities. Pins vary by grade and are awarded for various accomplishments. The purpose of this award is to recognize well-rounded individuals who exemplify the qualities that Mission Valley Elementary hopes to foster in all of its students. After completing sixth grade at Mission Valley, the students will take home the pennants as a symbol of remembrance.